“I want French fries!” Clara yelled to herself, “I can’t stand it any longer!” Since Clara started eating healthier for Glugar, she hadn’t tasted a single French fry for several months and now she was craving them! “I know what to do!” she thought, and walked straight to her school’s cafeteria during her morning break. There she saw the crispiest, most golden French fries she had ever seen—or was it just a hallucination? She counted her allowances for food and discovered that she had enough money for one delicious little bag of deep-fried potatoes. She could feel Glugar going higher and higher and shouting, “I told you so!” A battle between Glugar and the French fries started! She could clearly hear the “ouchs” “arrghs” “yays!” “ayes” that were going on inside her, and the more intense the battle became, the more physically tired and heavy she felt! “But, but …” Clara sobbed, “I will never be able to eat French fries again and I love them!” and she continued crying. “Aye ‘tis true!” a French fry yelled, and Clara finally smiled. 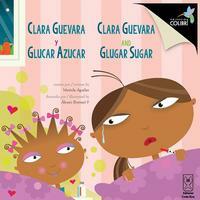 What a wonderful illustration of the challenging moments for kids like Clara. I plan to use this story with the students I work with in the years to come. Thank you Mariela!! I love the characters you are developing in your stories! Who knew that french fries talk like pirates! But appropriate for something trying to take over a little girl’s body. Keep up the great work, Mariela!